Posted on April 11, 2013 by Dayna B. Since I recently bought a shiny new camera, I also had to buy a new camera bag to keep her cozy and warm. Luckily, this purchase didn’t require any research (very much unlike my camera purchase) because I knew immediately what brand I would buy! About a year ago I discovered Pacsafe products and they are now my go-to brand for all of my travel baggage needs. 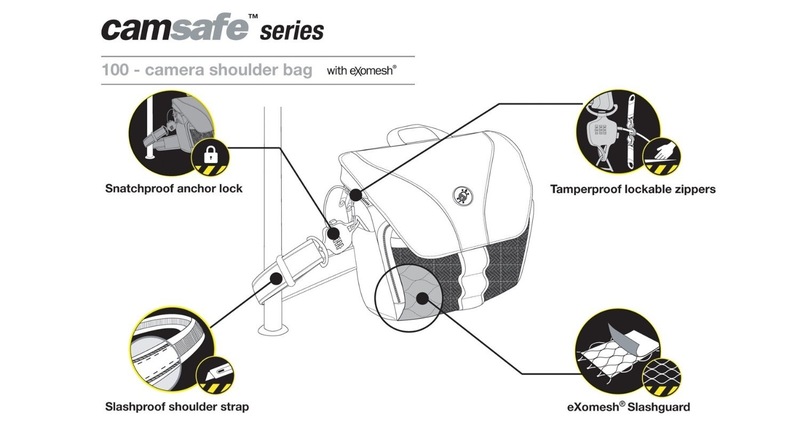 Pacsafe offers high-quality travel gear with a boat load of built-in anti-theft technology. Most of their products include features such as: slash-proof straps, RFID blocking pockets, locking zippers, & exomesh slash-guards. Have you ever had your gear stolen? If it has never happened to you personally, I’m sure you have at least heard stories from friends or family about getting ripped off while traveling. Having your passport or credit cards stolen can really ruin your vacation. Becoming a victim of identity theft could cause you to freeze all of your accounts while still in a foreign country. And those amazing photographs you shot, well they could be gone forever because of someone with sticky fingers! I like to think that I am a savvy traveler and I try to always maintain my situational awareness. Hauling my gear in a Pacsafe bag does not mean that I get to completely let my guard down while traveling, but it does provide added peace of mind. I am by no means suggesting that Pacsafe products will guarantee the security of your belongings, but I will say they add a few more barriers between your precious cargo and those pesky thieves. 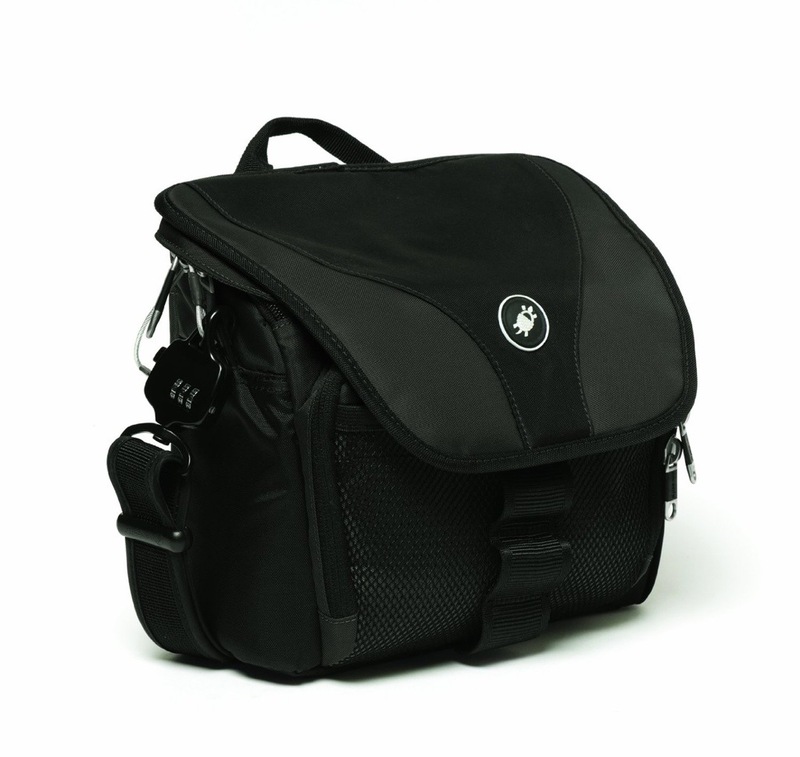 The newest addition to my Pacsafe arsenal is the Camsafe 100 Camera Shoulder Bag. This bag has plenty of padding, as well as anti-theft features that will keep my camera well protected. This bag also has lots of separate gadget pockets that are perfect for battery chargers, spare batteries, memory cards, cell phones, even a water bottle. This bag has enough room to carry all of my essentials while day tripping, thereby eliminating the need to also carry a purse. Score! I also own (and love!) the Pacsafe Slingsafe 300 Gii Backpack and Slingsafe 250 Gii Handbag. Why the turtle? 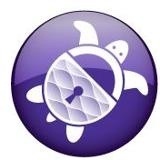 Pacsafe’s products were initially inspired by the independent global wanderings of the sea turtle. They now have their own turtle foundation to help the dwindling turtle population. And we all know how much I love to help the turtles! If you don’t know…click here and here. Posted on April 9, 2013 by Dayna B. As mentioned in a previous post, I was jonesing for a camera upgrade, but choosing the right camera for me was no easy task. After diligently researching every last detail (along with helpful input from others), I finally selected the camera that will (I hope) exceed my expectations as I trot around the globe. The Canon PowerShot SX40 and the Nikon CoolPix P510 were among my top 4 finalists, but in the end, they didn’t make the cut. Canon and Nikon are both well respected brands in the photography community, but the reviews I read led me to believe I would have been disappointed with these cameras based on shutter speed, battery life, and possibly even image quality. Both of these cameras had amazing optical zoom capabilities, but I was looking for more than just a good zoom. I was in search of a well-rounded camera that would suit all of my needs, not just a one-trick pony. I then went back and forth (for days!) between the Sony CyberShot HX200V and the Panasonic Lumix FZ200. They each had certain specifications that outdid the other, making it difficult to pick a clear winner. For example, the Sony had more megapixels, but the Lumix was slightly faster. The Sony had a GPS function, while the Lumix had a longer battery life. The Sony had a longer zoom, but the Lumix had better image quality. The Sony was cheaper and more within my price range, but the Lumix had a sharper lens. I agonized over these details trying to figure out which specifications were most important for my travel needs. 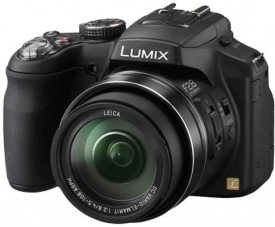 The Lumix was more expensive, but in the long run, I think I’m sure it is the better camera. 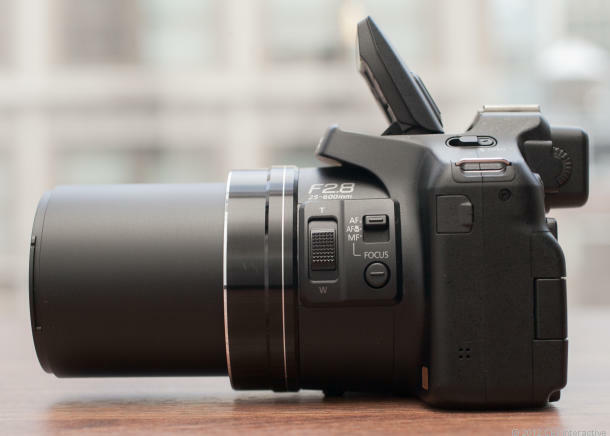 The deciding factor was the Lumix’s amazing zoom lens that has a constant f2.8 aperture through its entire zoom range! This is an amazing feature and it is the first camera in its class that has been able to accomplish this. What does all of that even mean, you ask? It means this camera is pretty stinkin’ awesome! In order to keep the size and the cost of a camera down, most super zoom lenses must decrease the aperture size as the lens zooms in. This lets in less light, which in turn can affect image quality. But not the Lumix FZ200. This super zoom lens lets in the same amount of light even when the lens is fully extended! I originally ordered this camera through an online website that I had never heard of before because it was listed $75 cheaper than on Amazon.com. Ten days later and my camera had not even been shipped yet. I called the shady website (with an even shadier Customer Service Rep) and learned that my camera wouldn’t arrive for another week! I decided the $75 savings wasn’t worth it, so I cancelled my order. Amazon shipped the camera immediately and it arrived two days later. Lesson learned….I heart Amazon! Because of my little ordering snafu, I have only had the chance to use the camera once. I used the camera on our recent trip to Norfolk and you can see those pictures here. So far I am extremely happy with my choice and I can’t wait to play with it more. Do you know a lot about cameras? Do you think I made the right choice? Posted on March 27, 2013 by Dayna B. About 6 years ago, I purchased an Olympus 550UZ super-zoom camera to better document my travels and record precious memories. The camera took great pictures, but what I loved most about it was that it had 18x optical zoom. At that time, super-zoom cameras were fairly fresh on the market, and in my humble opinion they were ideal for any traveler. I loved everything about this camera except the fact that it required 4 AA batteries, rather than a rechargeable lithium battery like many other cameras had. The camera seemed to just chew through AA batteries in no time and of course the batteries would always die at the most inopportune time. I learned very early on that I always needed to carry several packs of AA batteries as spares, but by the time I changed the batteries, the moment would have most certainly passed and the opportunity for my perfect shot was gone. I had been complaining about this battery problem for long enough, so it was finally time to purchase an upgrade. At first, Rob wasn’t really on board with this “unnecessary” added expense since our Olympus camera still worked. But then I ran this silly half-marathon and I suggested that I deserved a camera upgrade as a reward for completing my first half-marathon. He couldn’t really argue with me there….and so, the search for my new camera began. I am not interested in a fancy DSLR camera for several reasons. First of all, they are expensive and definitely above my price point. Second, they are way too heavy. I am not interested in lugging around a huge camera bag while traveling and having to switch out lenses for different shots. Third (and probably most important), I am not a professional photographer. As an amateur, I really don’t want to inundate myself with manual settings, ISOs and apertures. I am more of a “point and shoot” kind of gal. I am also not interested in a super compact digital camera. Many travelers prefer to use pocket-sized digital cameras while they are on the go. I can definitely see the allure of being able to fit your camera in your pocket rather than carrying around a camera bag, but I doubt those tiny cameras would live up to my expectations. With these criteria in mind, I came up with the Canon PowerShot SX40, Sony CyberShot HX200V, Nikon CoolPix P510, and Panasonic Lumix FZ200. I spent many hours across several days researching all 4 of these cameras. I asked for advice from friends and photographers alike. I read online reviews until my eyes were about to bleed. I agonized over every last detail. I finally made my decision and ordered my shiny new camera. I don’t want to reveal which one I picked until I have received it and get the opportunity to test it out. But in the meantime, I would love to know which camera you would have chosen and why. What type of camera do you prefer to use while traveling? Posted on February 12, 2013 by Dayna B.
I realize my timing is way off here being that we celebrated the new year well over a month ago, but I have never been one to make New Year’s resolutions anyway. And this year was no different. Instead, I somehow ended up with a list of goals for 2013. I don’t normally make lists of goals for the new year either, but this one just fell into place so I figured I would share it. Hopefully I can keep you all posted as I complete my 2013 goals! Posted on January 29, 2013 by Dayna B.
Luckily for Rob, he already had a tuxedo. I, on the other hand, had to find something to wear. I wasn’t looking to break the bank just to attend this event, so I was very happy that I found a gown online that looked like it would fit the bill. And for only $45 to boot!! Rob donned his tuxedo and I wore my new thrifty gown. As we were getting ready to leave, my dog, Ginger, was following me around the house, as she usually does, and she kept stepping on the very small train of the gown. That should have been my first clue that buying a gown with a train (even a very small one) was a mistake. But Ginger is a dog. She can’t be expected to understand this concept. Surely the humans at the ball would watch where they were stepping? Rob and I headed to the DC Convention Center and the line to get through security wrapped around several blocks! My initial thought….screw this, lets go home! But once the initial shock of it all passed, I was ready to stick it out. I almost didn’t bring a coat with me so that I wouldn’t have to deal with a coat check (and thousands of other people also checking coats), but after seeing the line I was grateful not to have made that mistake. Without the coat, I’m certain I would have bailed. But everything worked out and we finally made our way into the Convention Center. Once inside, we quickly headed to the bar. The place was a madhouse and Rob must have waited in line for at least 20 minutes to get us drinks. 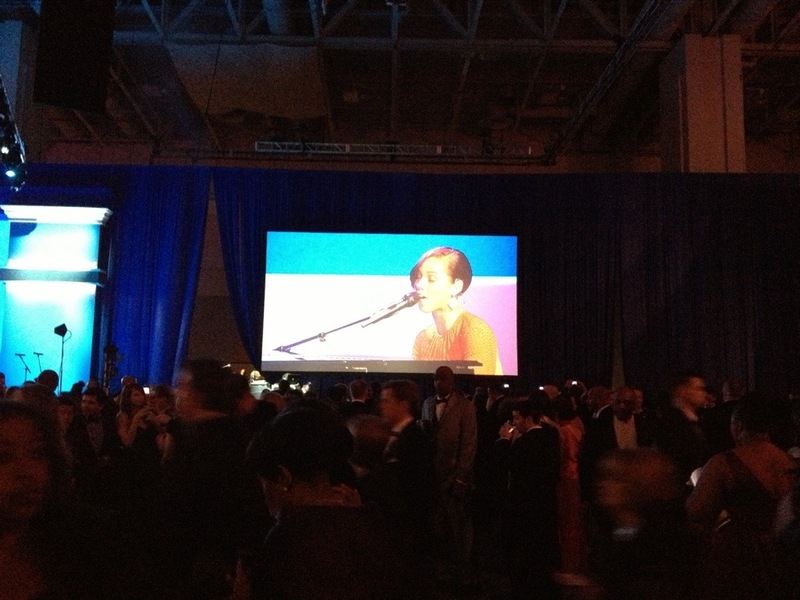 While Rob was in line at the bar, Alicia Keys took the stage…on the other side of the ballroom. She sounded great and at least I got to see her on the jumbotron. I’m pretty sure Rob was still on line at the bar when the Bidens came on stage, once again, at the opposite end of the ballroom. Jamie Foxx was singing and playing the piano while the VP and Dr. Biden danced. 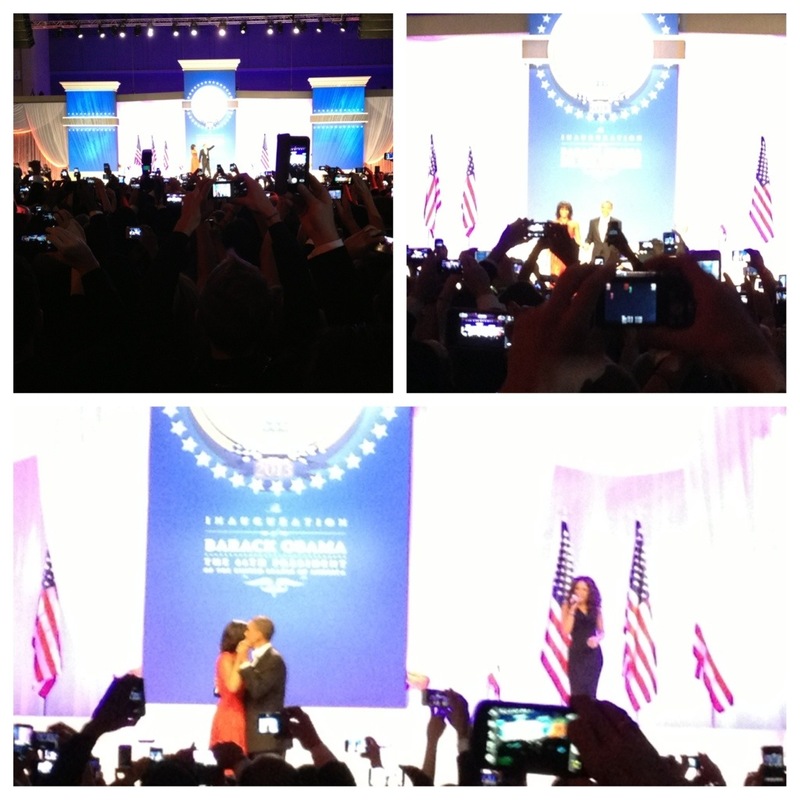 We made it to the other end of the ballroom in time for President Obama and the First Lady to take the stage. Jennifer Hudson sang (and looked fantastic!) while they danced. The crowd was basically a sea of cell phones raised up hoping to catch a decent picture. I didn’t bring my good camera with me, but Rob did a pretty good job with the raised cell phone method of the masses. 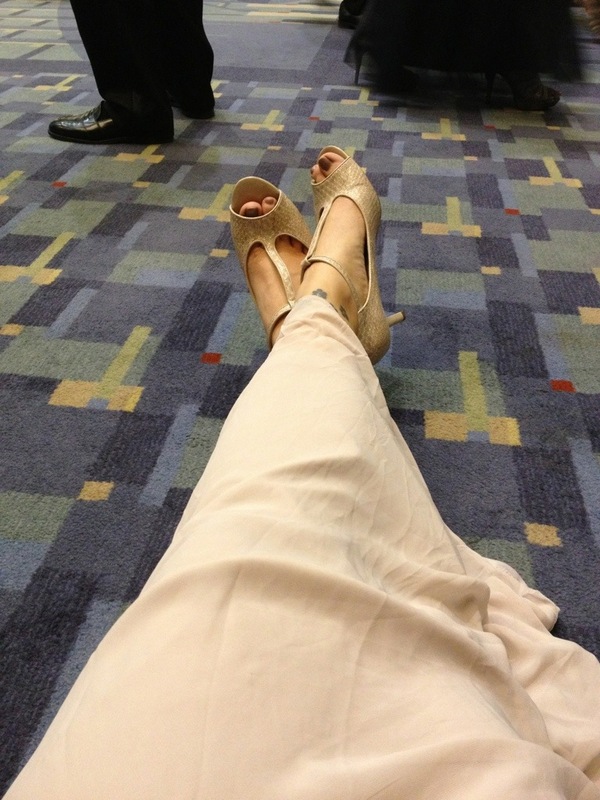 After the Obamas left and all the hype was over, I desperately needed to sit down and/or take off my shoes. There wasn’t a single chair in the entire place, so to the floor I went! I couldn’t understand why my feet hurt so bad. I had worn these shoes to weddings before and danced the night away without any problems. But, at those weddings there was always a seat available whenever I was ready to sit down. 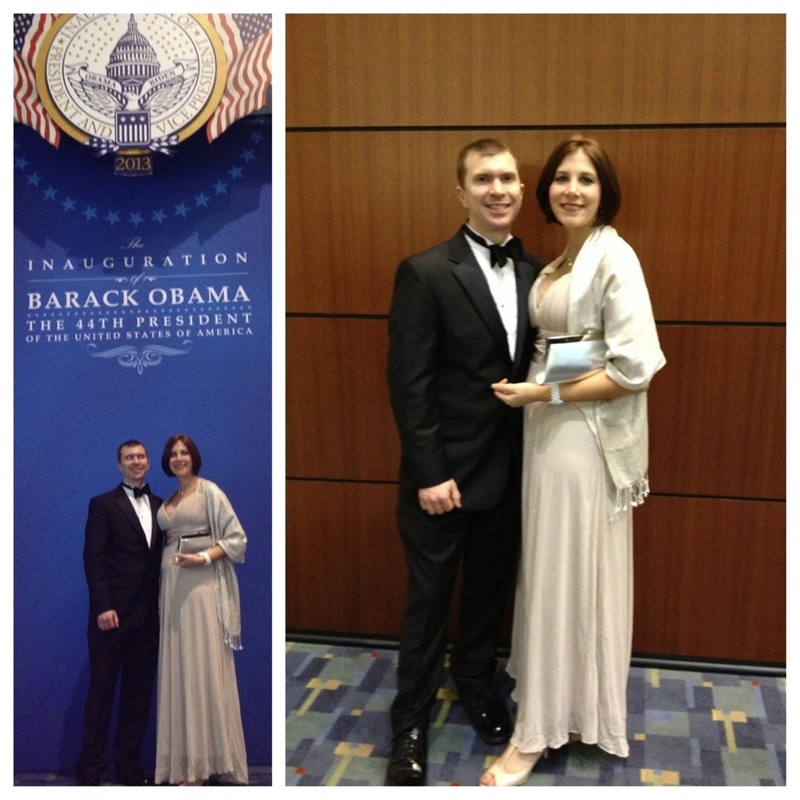 At the Inaugural Ball…not so much. We came, we saw… although not so sure we conquered. Neither one of us wanted to get in line at the bar for additional drinks and my feet were really not on board with this whole no-chair situation. So we decided to call it a night. I think that makes us officially old, but I’m okay with that. The following day, so many people asked me if it was fun. No. Fun is definitely not the word I would use here. Don’t get me wrong, it was an awesome experience and I am definitely glad that we went. But if it were fun, I would take that to mean that I would look forward to doing it again. I guess a lot could happen in four years and I might change my mind, but I seriously doubt I would want to attend again. Posted on January 24, 2013 by Dayna B. Unfortunately, I am quite behind with my blog posts as I still need to post about the inauguration and the inaugural ball. Additionally, I arrived in Nicaragua yesterday, so of course I will have plenty of travel posts to share as well. But until then, I wanted to point out that I am 35 years old and Nicaragua marks the 35th country I have been to. Not a bad age:travel ratio if you ask me! 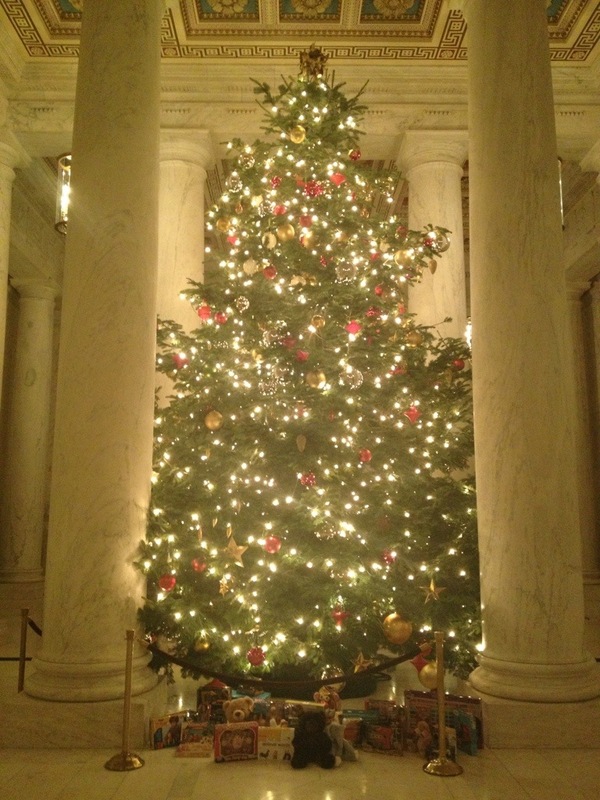 Posted on December 12, 2012 by Dayna B.
I think it is safe to say that my office has the most amazing Christmas Tree in all the land! 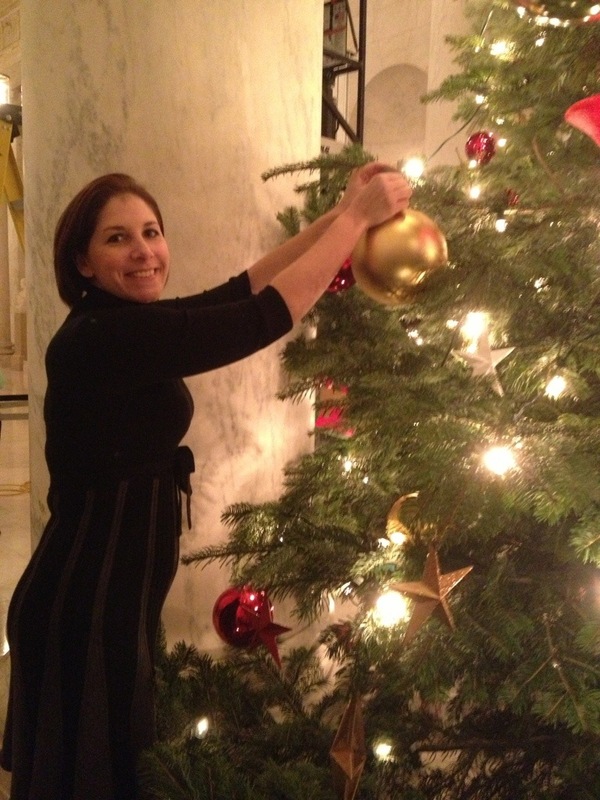 Every year, the employees gather for the annual Tree Trimming Party. 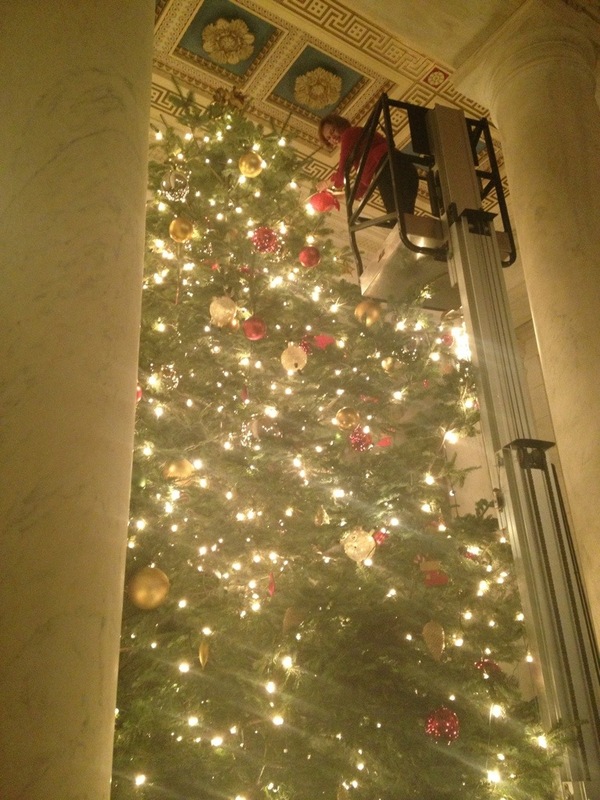 There are tasty refreshments and everyone helps to decorate the tree. 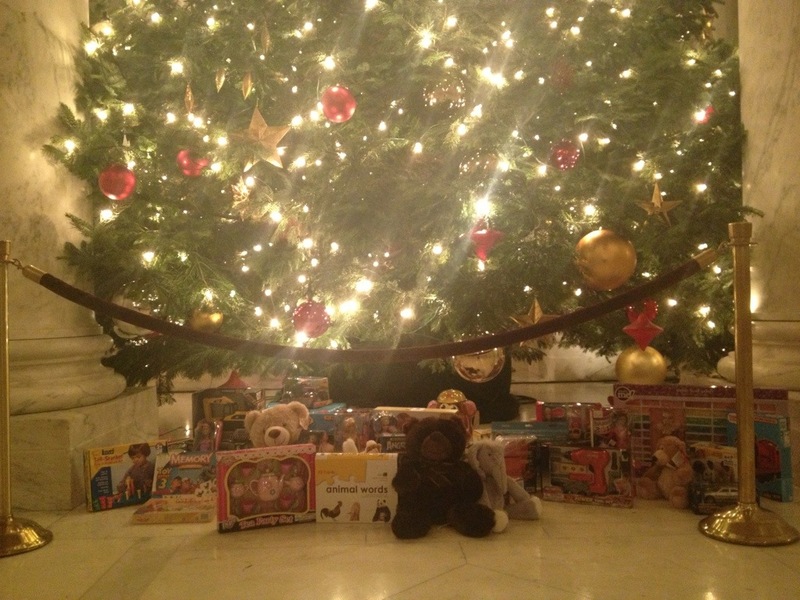 And because this is the season for giving, generous employees place gifts under the tree that will be donated to Toys for Tots. Posted on December 11, 2012 by Dayna B. 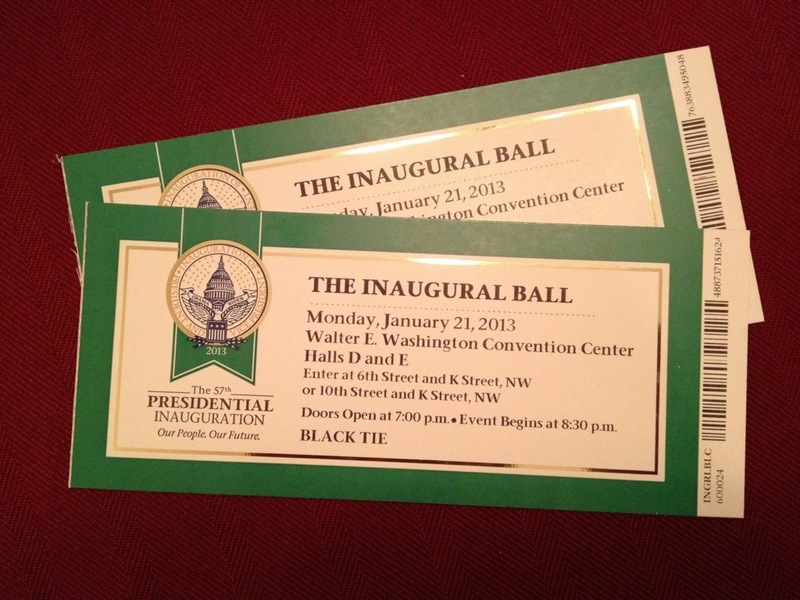 This past Sunday, we had tickets for the dress rehearsal of the 31st annual “Christmas in Washington” at the National Building Museum. 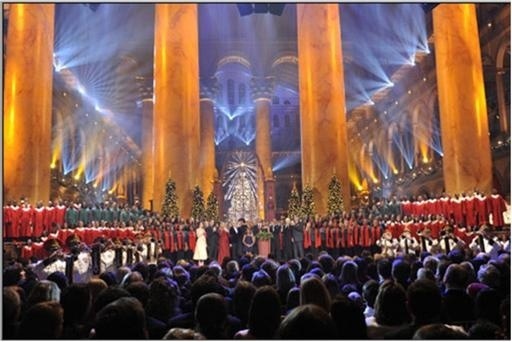 This annual Christmas concert benefits the Children’s National Medical Center and is attended each year by the President, as well as many other Washington VIPs. We aren’t important enough to attend the actual concert alongside the President, but the dress rehearsal is usually just like seeing the real deal (more on this later). The National Building Museum is absolutely beautiful and seems to be the perfect location for this show. Unfortunately, I wasn’t allowed to take any pictures, but here is a picture from a previous year so you can get the idea. Conan O’Brien hosted the show for the second year in a row. This year, the performers included Megan Hilty (Smash), Demi Lovato (The X Factor), Chirs Mann (The Voice), Scotty McCreery (American Idol), PSY (“Gangnam Style” internet sensation), and Diana Ross (you know who she is). I was most excited to see Diana Ross perform. Although her music is before my time, she is a legend, and I thought it would be an amazing experience to see her live. However, she did not grace us with her presence during the dress rehearsal. Instead, a cheerful, elderly man filled in as her stand-in and quietly mouthed the lyrics to the songs Diana would sing later that night. You could see that he was feeling uncomfortable knowing the crowd was disappointed to see him instead of Diana Ross. But he made the most of it and even gave us a few laughs. As endearing as this old man was, I was still thoroughly annoyed that Diana Ross didn’t come on stage. Talk about a DIVA! Ok, so what if you’re a legend. Does that mean you are too good to rehearse? Are you too important to perform for the minions that could only get tickets for the dress rehearsal? After the rehearsal was over, we heard that Diana Ross didn’t participate in the rehearsal due to a broken ankle because it was too difficult to get on and off the stage. According to this article, the claim is true. However, I have decided to reserve my judgment until I watch the show when it airs. You better have a gimp Diana! If the video doesn’t load, you can also view it here. Here are a few photos of some of my favorite costumes mentioned in yesterday’s Jingle All The Way post. 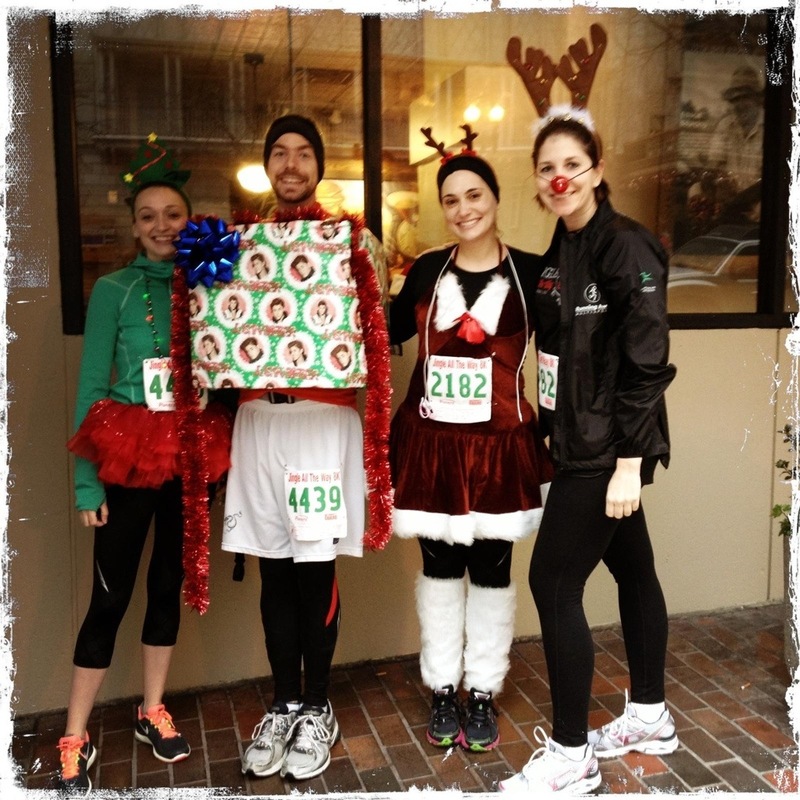 Posted on December 10, 2012 by Dayna B.
I am pretty sure that I may have mentioned that I do NOT enjoy running. 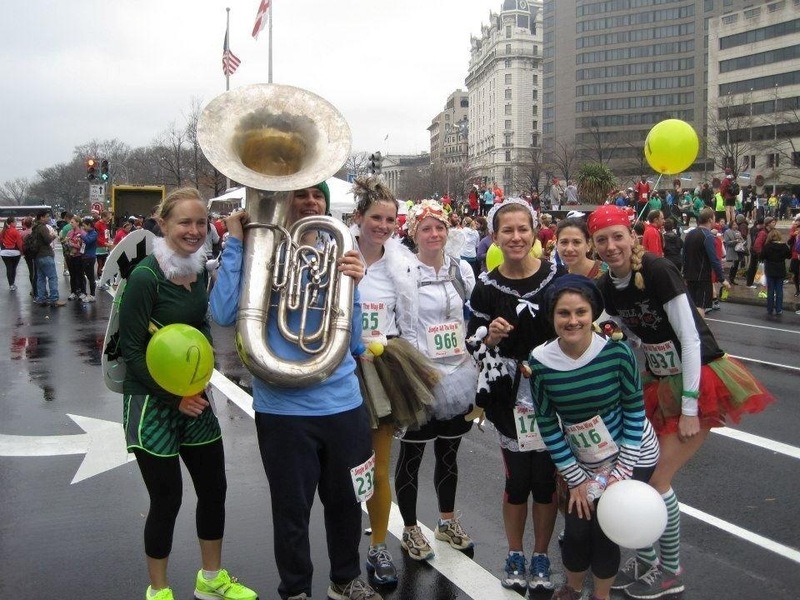 Yet, once again, here I am writing about a race I just completed. Why do I keep participating in these events, you ask? 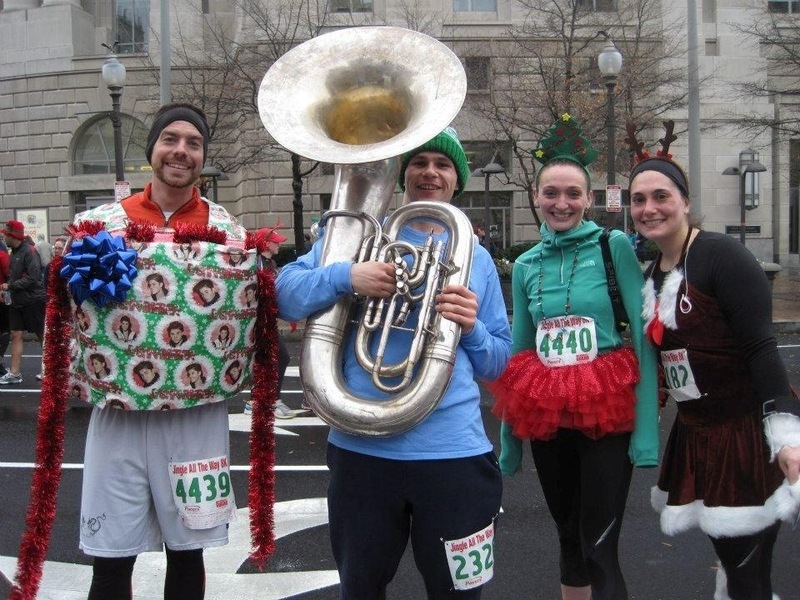 Well, I guess watching people run dressed up like Santa, elves, and reindeer makes running just a tad less miserable. Oh, in case you were wondering…that IS Justin Bieber wrapping paper! 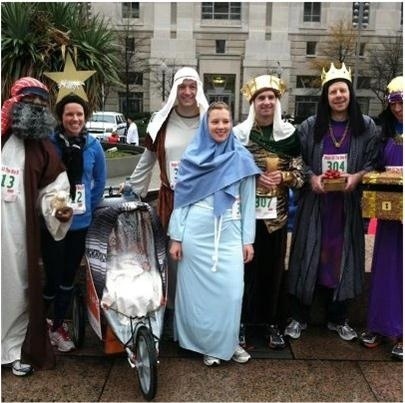 Mark’s costume definitely drew the most attention (rightfully so) and he even scored a radio interview before the race. Andrea is still trying to forgive him for missing what could possibly have been his one and only chance to use the phrase Bieber Fever on the radio!